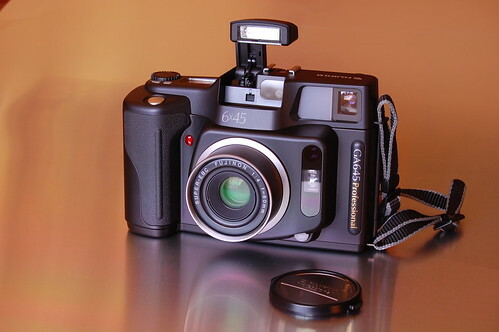 The Fujifilm GA645 Professional is an autofocus medium format camera introduced by Fuji circa 1995. 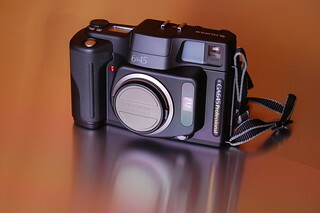 It uses 120 / 220 roll film and captures images in a 645 format. 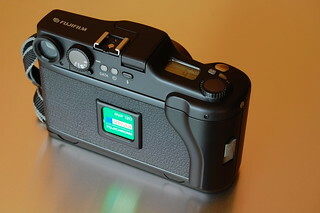 It is succeeded by the Fujifilm GA645i, released in 1997. The GA645 uses a Super EBC Fujinon 60mm f/4 lens while the similar GA645W uses a wider 45mm f/5.6 lens. It is based on a 7 element in 6 group lens design with a minimum focusing distance of 0.7m. The shutter is electronically controlled with speeds of 2 sec to 1/700 of a sec. but for the aperture range of f/4 to f/9.5 can only go as fast as 1/400 of a sec. smaller apertures of f/11 and f/22 can use the faster shutter speeds. There is a screw-in shutter release cable socket on the right side of the body. A electronic self-timer is available with a delay of 10 seconds. The finder is in a portrait format orientation instead of the more common landscape format. It is based on a 3 glass element reverse Galilean design. There is a 93% field of view from 3m to inf; 91% at closer distances and a magnification of 0.5x. It has bright lines with moving parallax correction frame based on the focus area. It has additional information including aperture, shutter speed, focus distance (m or ft), as well as exposure meter information. The exposure system is a center-weighted system using a silicon photo diode. It has a range of 3 to 19 EV (ISO 100). It is not a TTL type system, but a TTF (Through The Finder) system. The meter settings supports film speeds of 25 to 1600 ISO in 1/3 increments. Exposure modes include (P) programmed auto, (A) aperture priority, and (M) manual exposure mode. Exposure modes can be changed with the dial near the eyepiece. A bulb mode is also available in manual exposure mode. There is a built-in pop-up flash with a GN of 12. 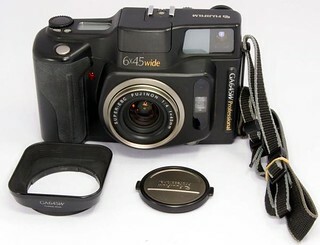 There is also a accessory hot shoe for external strobes, a flash unit that covers the 35mm focal length is recommended. The shoe can support up to 0.5A 400V. A dedicated unit was produced for this camera called GA Strobe. An accessory flash GA Bracket was also available. It includes a grip mounted to the base of the camera, flash bracket and hot shoe adapter for sync cable. Exposure and date time information can be imprinted on the film outside the photo area. Press the data button to change the imprint data format. Options include Year/Month/Day, Day/Hour/Minute, exposure mode/aperture/shutter/exposure comp/focus, Year/Day/Hour/Minute and OFF. The year can be set from (19)94 to (20)25. The film transport is motorized with a automatic film advance. It also supports fully automatic film loading. This does not require matching the backing paper start mark to a body indicator for first frame loading. This is done by a reflector sensor in the film chamber detects the presence of film or paper. The main up and down setting dial can be used to rotate the take up spool for easier leader insertion. Close the back and the camera detects the first frame. A electronic warning beep is emitted on the last frame of the roll. This sound can also be disabled by pressing and holding the self-timer button while off and rotating the mode dial to ISO. When the last exposure is complete, the film is wound automatically to the take up spool. 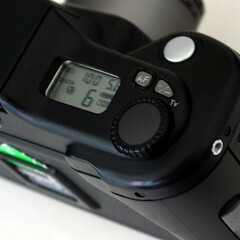 Mid-roll rewind is possible with a button on the base of the camera. It is able to capture 16 exposures on 120 film, while using 220 film yields 32 exposures. The film back is wrapped in a leatherette type material and has a film reminder memo holder for film box tops. The approx number of frames shot on the camera can be display by pressing and holding the exposure comp button while camera is off and switching to ISO. This an averaged number and updates every 100 frames or so. The LCD display located on the top has information such as exposure counter, shutter, aperture, ISO, 120 or 220 film, battery, flash, exposure comp, self timer, MF mode, date, time, focusing distance and total frame count. The distance unit can be switched between meter and feet. To do so press and hold the AF button when camera is off; rotate the mode dial knob to ISO, either ft or m will be displayed on the LCD. The camera is powered by 2x CR123A battery located on the base of the handgrip. It requires a coin or similar to unscrew the battery compartment. The battery has a capacity of approx 3000 shots without flash, and 600 with flash (50% intensity). 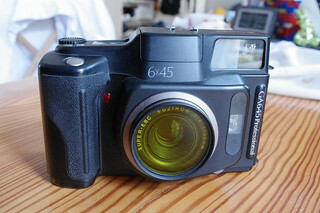 The Fujifilm GA645W or Fuji 6x45Wide is another available version sharing a similar body specifications but with a 45mm f/4 lens. Fujinon Super-EBC f=60mm 1:4, 6 components, 7 elements. Hybrid active/passive auto-focus, focus lock and manual zone focus. Program, aperture-priority and manual mode. Exposure compensation +/- 2 EV. Bright viewfinder with automatic parallax correction. Data printing outside the frame, date/time/shutter speed/aperture/exposure compensation. Built-in pop-up fill flash (GN 12). This page was last edited on 13 October 2018, at 20:20.